A community art project launched in 2017 enriched the lives of 950 participants and their audiences with the inspiring message that we all are part of life’s big picture. Senior living residents from two communities in Atlanta, Georgia, collaborated with participants of all ages and abilities from the community at-large to create a multidisciplinary performance blending dance, theater, music and visual art. And the active-aging professional who initiated the project envisions further opportunities to celebrate living well through creativity. 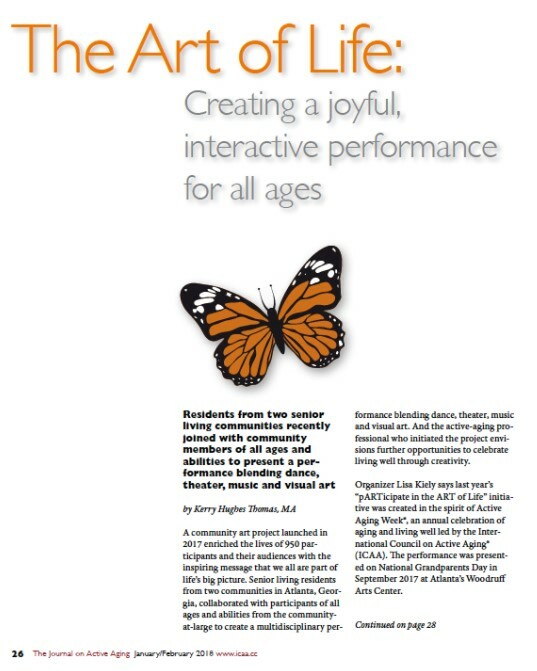 Organizer Lisa Kiely says last year’s “pARTicipate in the ART of Life” initiative was created in the spirit of Active Aging Week®, an annual celebration of aging and living well led by the International Council on Active Aging® (ICAA). The performance was presented on National Grandparents Day in September 2017 at Atlanta’s Woodruff Arts Center. “It was simply all about bringing joy, connection and purpose,” Kiely comments of the event that involved musicians, dancers and artists from the Lenbrook and Park Springs senior living communities, the Atlanta Symphony Orchestra and the Decatur Family YMCA. The performers offered an innovative interpretation of the 1970s song Lean on Me beneath canvases of butterflies painted by the senior living residents and other community groups. Kiely credits a chance meeting more than a decade ago with ICAA CEO Colin Milner and their subsequent conversations with inspiring her to accomplish her vision to create events using art and performance to bring people together and enhance the lives of older adults. In 2012, she helped organize a “flash mob” in the city square in Decatur, Georgia, featuring Park Springs residents and participants from Decatur Christian Towers seniors apartments, City of Decatur employees and residents, and YMCA staff and members. The response to the flash mob was “awesome,” Kiely says, and helped her realize that there must be many ways to “interweave a greater variety of creative expressions capturing many dimensions and domains of well-being.” That led her to envision “pARTicipate in the ART of Life,” although the final product evolved from her original ideas in order to meet the needs of sponsors and participants. Eventually, Kiely and several resident champions and enrichment team members chose Lean on Me as the theme song because it “crossed generational and socioeconomic boundaries and spoke to everyone,” she says. The “Life Span of the Monarch Butterfly” was chosen as the theme for the visual facets of the project “because it represents change and transformation,” Kiely continues. All four stages of the monarch’s development—egg, caterpillar, chrysalis and butterfly—are beautiful and significant, she says, an important reminder for humans of all ages and stages. To bring the project to life, Kiely reached out to many individuals and organizations to partner with Lenbrook. “The partner resources came in many forms,” she says. “Volunteer workers. 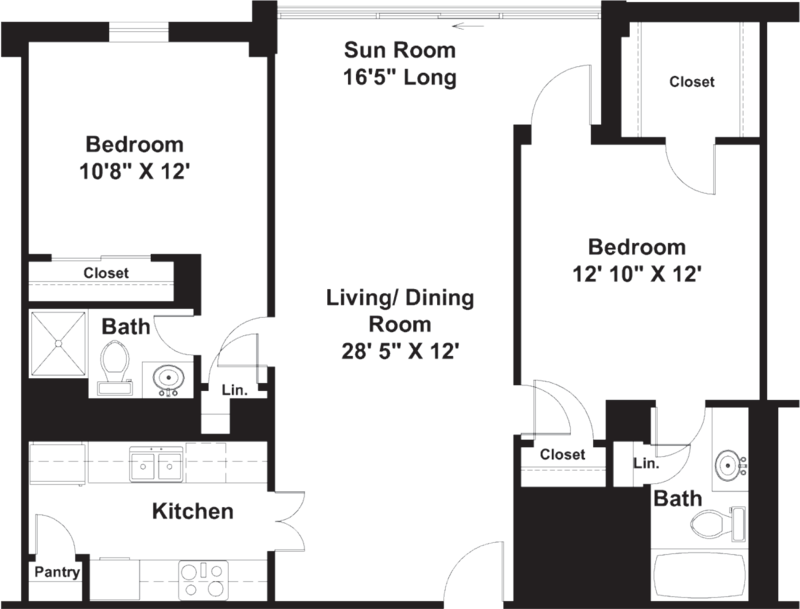 Available space. Great talent. Financial help. “Park Springs immediately agreed to partner with us by contributing financially as well as creating two canvases, providing singing and dancing opportunities on their campus and enthusiastically participating on the day of the event,” Kiely shares. Atlanta’s Woodruff Arts Center (WAC) agreed to help sponsor the event as part of a family day festival at the Center, which is one of the largest arts centers in the world and one of the few that offers both visual and performing arts on one campus. Because the project involved so many partners and so many diverse elements, notes Kiely, it was difficult to fully organize in advance. In addition, groups from the YMCA, the Arches and Park Springs all worked on various aspects of the project in their own communities. And one butterfly canvas was created by a family who wanted to be involved. Kiely’s original concept of several canvases, created by various groups, coming together to make one image was modified to provide “a quick and easy assembly and disassembly process” that would allow the performance to be staged in a variety of places and to compensate for a “potential shortage in manpower and resources,” she explains. Adapting ideas and modifying plans to fit the changing circumstances provided Kiely and her team with many challenges, especially because the project had to be developed in only four months. Kiely’s primary goal, as Lenbrook’s director of enrichment, is to ensure that participants are “present, engaged and enjoying a purposeful experience,” and she believes the Art of Life event met those goals. “This project provided residents more meaning, purpose and positive feel to some of the already existing enrichment programs enjoyed at Lenbrook, such as spirituality, singing, dance and art,” she notes. Since the September performance, residents have been asking what comes next and reminiscing about how much fun the event was. Kiely learned a lot about how to create and organize events through this process, she says—“most importantly” that these programs require a lot of time. Organizers should have at least “a skeleton plan” of what will be needed to produce the event at least six months in advance, she says. And formal contracts should be made with participants, a lesson she learned when some organizations withdrew over the life span of the project. Now Kiely is looking to the future. “Our plans are to make this an annual event, in conjunction with Active Aging Week and aligned with Grandparents Day, to help raise awareness and increase involvement in the event.” But she is also looking to enlarge opportunities for engagement and participation. See the "pARTicipate in the Art of Life " video here. Kerry Hughes Thomas, MA, is a freelance writer who contributes on topics related to gerontology and the aging industry. Hughes Thomas has a master’s degree in gerontology from Georgia State University and a bachelor’s degree in journalism from the University of Wisconsin– Madison. Her 20+ year career includes roles in public relations, marketing and relationship management. In recent years, she has paired her love for writing with her love for older adults by partnering with an Atlanta-based hospice organization to facilitate and compose life stories for patients. Within that capacity, she was profiled in the Atlanta Journal-Constitution’s Living Section for its regular feature Extraordinary People in 2013.